LeBron James's return to Cleveland was the biggest story of the 2014 NBA offseason, but in the not-so-distant future we may be referring to it instead as the summer of Anthony Davis. With almost none of America's big stars playing in the FIBA Basketball World Cup, the 21(!) year old power forward anchored the American's lockdown, gold medal-winning defense. That was enough to turn the hype machine into overdrive, and for many people to proclaim that Davis was already one of the five best players in the NBA. If the first game of the season is any indication, those lofty expectations may be on point. In a 17-point beatdown of the Orlando Magic, Davis notched 26 points, 17 rebounds, and 9 blocks, as well a couple of steals and assists thrown in for good measure. Nobody has put up a 26/17/9 line since Dwight Howard in 2008, and before that Shawn Bradley in 1994. While Davis wasn't efficient enough on offense, he showed off an encouraging repertoire of ways to score. All of the old favorites—dunks, baseline cuts, fast breaks, offensive rebounds—were there, as well as Davis's continually improving jumper. But what was most promising was how frequently, and how competently, Davis put the ball on the floor. He's still not quite polished enough to regularly score off of it yet, but that should come shortly. With his jumper now solidly competent, guarding Davis will be nigh-impossible. Sag back on him and he'll hit the shot; play up on him and he'll blow by you with a handle that he didn't have last year, and should be illegal for a guy 6'10". Tonight he used his dribble to change angles for assists, and took care of the ball well enough to avoid committing even a single turnover. Tomorrow he's going to use it to get to the rim quicker than you can blink, and that should scare defenses shitless. 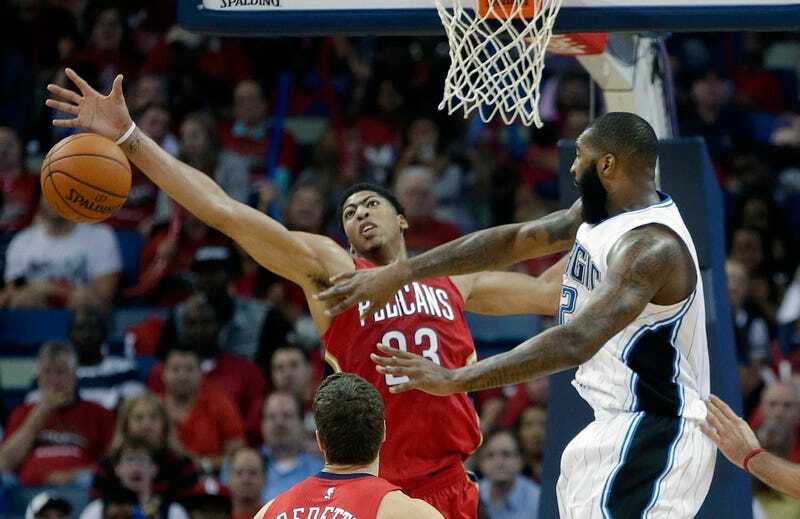 In Davis's 36 minutes on the floor, the Pelicans had a defensive rating of 82.5. For context, last year's best defense (the Pacers) had a 99.3 defensive rating across the entire season. Sure, they won't get to play teams as bad as the Magic every single night, but with Davis and Asik anchoring one of the best defensive front courts in the league, that alone will allow the Pelicans to compete every single night. And if Davis's offensive game continues its upwards trajectory? Well, then the Pelicans might just surprise a Western Conference power come playoff time.